A seminar focused on governance, with over 160 people from government agencies, business circle and the academia attending, opens in Quanzhou, Fujian Province, on Aug. 17 in the run-up to the BRICS summit early next month. Themed on "Openness, Inclusiveness, Mutual Benefits and Win-Win: Working Together to Build a Community of Shared Future for Mankind," the two-day event is hosted by the Publicity Department of the CPC Central Committee and co-organized by the Chinese Academy of Governance and China International Publishing Group (CIPG). Speaking during the opening ceremony of the event, Huang Kunming, deputy head of the Publicity Department of the CPC Central Committee, pays tribute to the event, an instructive platform for lively discussion and mutual learning. "It is of great significance for BRICS countries who are undergoing development at a similar stage and facing shared challenges to discuss and learn from each other for a better shared future." Five BRICS countries, namely Brazil, Russia, India, China and South Africa, are assuming a greater role in the world arena with statistics showing that their combined economic output accounts for a quarter of the world's and their contribution to world economic growth is almost 50 percent. Huang suggests that the seminar should be a long-term program, affording space to bring together think tanks and the media to provide intellectual support for common development while expanding the scale of exchanges and cooperation under an environment of more players joining in. Mizengo Peter Pinda, former prime minister of Tanzania, viewed the event as a special and unique gathering, commenting: "In a scenario of a successful BRICS, developing countries can identify with the objectives of this seminar of building a shared future for mankind, with transparency, openness and inclusiveness in our cooperation, with mutual benefit and a win-win for all." The seminar includes an opening ceremony and three parallel meetings which center respectively on "enhancing reform for common development," "increasing communication for cultural prosperity," and "strengthening collaboration for global governance." 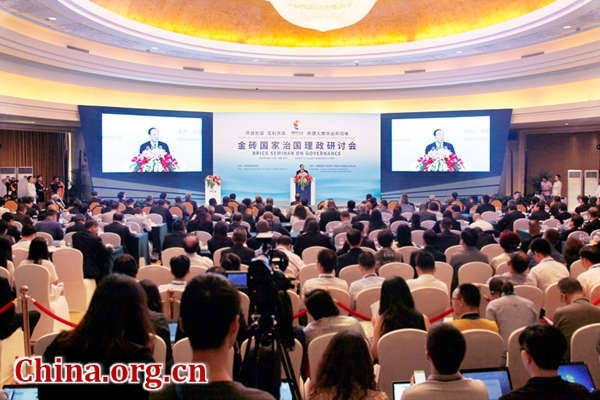 A seminar focused on governance, with over 160 people from government agencies, business circle and the academia attending, opens in Quanzhou, Fujian Province, on Aug. 17.